In this issue we’ve two main stories – an update of our own events page, updated since its launch at the start if the month, as well as of an event this coming weekend. Community archaeology has been active since the start of the year and CBA North Committee also been busy chasing up leads for stories we think will be of interest to you. We’ll continue, however, to highlight local groups activities and events as well. Now we are in 2017 we’re looking forward to hearing of your plans for this year. We have updated our own Committee pages to refresh the details, including some pictures, of your committee for 2017. [The Enriching The List project has been underway for some time now. Within the CBA North region there are all types of designated sites that might be investigated and pictured. These include the 15000th entry for the national project with a picture of Egglestone Abbey, near Barnard Castle, County Durham. 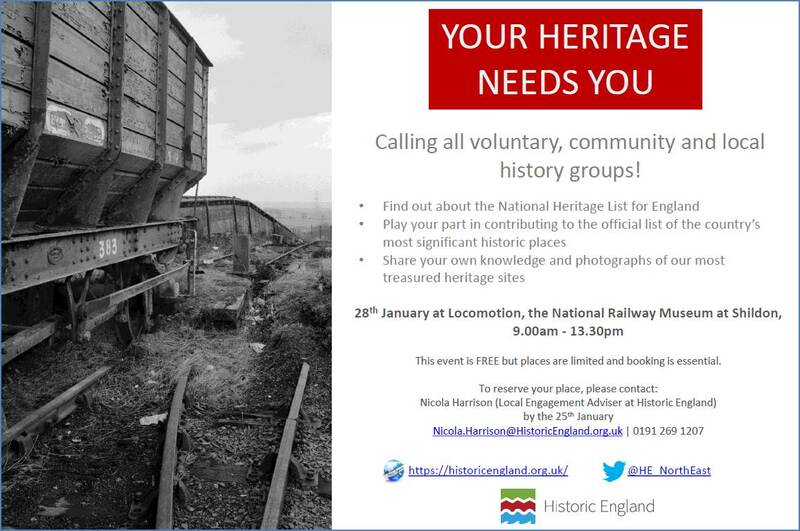 We would like to invite you to attend a free Historic England workshop being held at Locomotion, the National Railway Museum at Shildon on Saturday the 28th January, 9.00am – 1.30pm. The event will provide information on the National Heritage List for England (the official list of England’s most significant places) and will explain how local heritage and community groups can add their own information to this list. The museum is also offering delegates a free Railways Tour after the workshop. Further details on the project can be found at here. A particular focus for the project, particularly apt for Shildon and the north east generally, will be for local railway information. Other examples of what has already been submitted can be found with the #ListEngland hash tag on Twitter. We have continued to update our CBA North website pages throughout January. We now have a list of 62 events throughout 2017 of our local groups and others again. Let us know of any more that you know of – either as part of a regular series for the Events page or as specials which we can publicize for you – throughout the year. Our last email was opened by 183 people (so far) across, and beyond, the CBA North region. If you can’t see your local society’s programme here, please let us know if you want that adding in. This entry was posted in E Newsletter and tagged Archaeology, archive, CBA North, County Durham, Enriching The List, Historic England, railways on January 23, 2017 by cbanorth. In case you missed our original blog post about the Gertrude Bell Newcastle Insights Lecture earlier in the year, this weekend will be your last chance to visit The Extraordinary Gertrude Bell exhibition. CBA North members are warmly invited to visit the Extraordinary Gertrude Bell Exhibition which ends on 3 May 2016 in the Great North Museum Hancock, Newcastle. Although much of her work took place in the Middle East, Gertrude Bell remains one of North-East England’s most internationally famous archaeologists; she also had a significant impact on the contemporary world. Between 1900 and 1914 Bell travelled extensively in what are now Turkey, Syria, Iraq, Jordan and Saudia Arabia. Her main interest at the time was in the Byzantine and early Islamic Architecture which she recorded carefully with notes, photographs and scale drawings. Her travels enabled her to meet people, learn languages and understand the topography of relatively unstudied areas. Bell was one of several archaeologists, including for example T.E. Lawrence and D.G. Hogarth, whose experience travelling in the Ottoman Empire before World War I lead to new influence working for British military intelligence. A century ago Gertrude Bell was based in Mesopotamia supporting the war effort first in Basra and later in Baghdad. She stayed on after WWI and was given the responsibility of writing the government white paper to review the situation in Mesopotamia from the beginning of British involvement in the region. By her death in 1926 she had been instrumental in the choice of Faisal as the first king of the new state of Iraq, as well as drawing up its boundaries, writing its antiquities laws and founding the Baghdad Museum. The current exhibition has material from the Imperial War Museum, the British Museum and the Royal Geographical Society as well as artefacts she brought back which were given by her half-sister to the Dorman Museum, Middlesbrough, and numerous photographs and material from the Gertrude Bell Archive which was given to Armstrong College, Durham (now Newcastle University), by her family. On sale are various books including The Extraordinary Gertrude Bell containing short essays by academics from Newcastle University about various aspects of Bell’s life, and for a longer read, Lisa Cooper’s 2016 In Search of Kings and Conquerors: Gertrude Bell and the Archaeology of the Middle East. I.B. Taurus. There is also a public lecture programme alongside the exhibition (see the website at https://greatnorthmuseum.org.uk/whats-on/the-extraordinary-gertrude-bell). [Editor’s Note: there is a connection between Gertrude Bell and the site that we’ll be having a guided tour of following our AGM business and updates in mid-June. If you’ve not signed up already for the AGM please do remember to do so. We will announce when the further papers promised in the initial announcement are on our website for your perusal and inspection. All CBA North Members will have had an email with the details of the AGM already]. This entry was posted in E Newsletter and tagged Archaeology, archive, Exhibition, Great North Museum, Newcastle on April 29, 2016 by cbanorth. On Saturday, February 20th 10am – 12 noon at Branxton Village Hall, there will be an opportunity to see the maps, photographs, and documents at the Branxton Road Show of the Till Valley Archaeological Society (TillVAS) Village Atlas Project which project members have collected. If you live, or have lived, in Branxton, or if you ever had family living there or are simply interested in the history of a Northumberland village which dates back centuries you might be interested in this event. There is no charge to attend the event. Refreshments will be available and all are welcome. This project is one of those sponsored by the Heritage Lottery Fund. This entry was posted in E Newsletter and tagged Archaeology, archive, historic buildings, Multi-period, Northumberland, Till Valley, TillVAS on February 13, 2016 by cbanorth.